769 people want to go here. 368 people have been here. Greece is a country in Southern Europe, on the southernmost tip of the Balkan peninsula, with extensive coastlines and islands in the Aegean, Ionian, and Mediterranean Seas. It shares borders in the north with Albania, the Republic of Macedonia (FYROM), Bulgaria, and Turkey. It has an ancient culture that has had a significant influence on the arts, language, philosophy, politics, and sports of western society, including the genres of comedy and drama, western alphabets, Platonic ideals and the Socratic method, democracies and republics, and the Olympics. The Parthenon is a temple in the Athenian Acropolis, Greece, dedicated to the Greek goddess Athena, whom the people of Athens considered their protector. 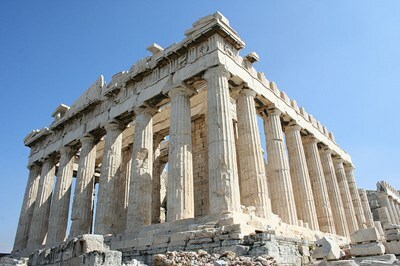 Its construction began in 447 BCE and was completed in 438 BCE, although decorations of the Parthenon continued until 431 BCE. It is the most important surviving building of Classical Greece, generally considered to be the culmination of the development of the Doric order. Santorini, also known as Thera is a volcanic island located in the southern Aegean Sea, about 200 km (120 mi) southeast from Greece's mainland. It is the largest island of a small, circular archipelago which bears the same name. It forms the southernmost member of the Cyclades group of islands, with an area of approximately 73 km (28 sq mi) and a 2001 census population of 13,670. 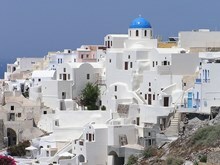 It is composed of the Municipality of Thira (pop. 12,440) and the Community of Oía (Οία, pop. Athens, the capital and largest city of Greece, dominates the Attica periphery; as one of the world's oldest cities, its recorded history spans around 3,400 years. The Greek capital has a population of 745,514 (in 2001) within its administrative limits and a land area of 39 km (15 sq mi). The urban area of Athens extends beyond the administrative city limits with a population of 3,130,841 (in 2001) and a land area of 412 km (159 sq mi). 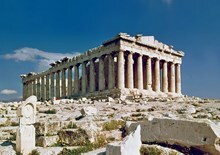 The Acropolis of Athens or Citadel of Athens is the best known acropolis (Gr. akros, akron, edge, extremity + polis, city, pl. acropoleis) in the world. Although there are many other acropoleis in Greece, the significance of the Acropolis of Athens is such that it is commonly known as The Acropolis without qualification. The Acropolis was formally proclaimed as the pre-eminent monument on the European Cultural Heritage list of monuments on 26 March 2007. Acropolis means "highest city" in Greek, literally city on the extremity and is usually translated into English as Citadel (akros, akron, edge, extremity + polis, city, pl. acropoleis). For purposes of defense, early people naturally chose elevated ground to build a new settlement, frequently a hill with precipitous sides. In many parts of the world, these early citadels became the nuclei of large cities, which grew up on the surrounding lower ground, such as modern Rome. The Mid-Autumn Festival, also known as the Moon Festival or Mooncake Festival or Zhongqiu Festival, is a popular lunar harvest festival celebrated by Chinese and Vietnamese people. A description of the festival first appeared in Rites of Zhou, a written collection of rituals of the Western Zhou Dynasty from 3,000 years ago. The celebration became popular during the early Tang Dynasty. Greece has a large number of islands, with estimates ranging from somewhere around 1,200 to 6,000, depending on the minimum size to take into account. The number of inhabited islands is variously cited as between 166 and 227. Only 78 of them have more than 100 inhabitants. The largest Greek island by area is Crete, located at the southern edge of the Aegean Sea. Santorini, also known as Thera is a volcanic island located in the southern Aegean Sea, about 200 km (120 mi) southeast from Greece's mainland. It is the largest island of a small, circular archipelago which bears the same name. August is the month when Athens is full of cheers. Of the festivities of Athens in the month of August, the Full Moon festival holds a special attraction. During this festival, both locales and tourists are allowed free entry to the city’s major monuments, museums and archaeological sites." The Hellenic Festival organised in the Herodes Atticus theatre of Athens is the most joyous celebration of Greekness following a string of performances: opera, ballet, classical music & dance, jazz and theatre shows. Artistes from across the world participate in this festival to showcase their talents." 'Suspended in the air' (the meaning of Meteora in Greek), these monasteries represent a unique artistic achievement and are one of the most powerful examples of the architectural transformation of a site into a place of retreat, meditation and prayer. 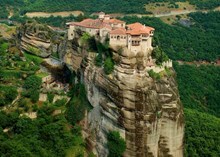 The Meteora provide an outstanding example of the types of monastic construction which illustrate a significant stage in history, that of the 14th and 15th centuries when the eremitic ideals of early Christianity were restored to a place of honor by monastic communities."